For nine months of the year, snow dominates the Arctic tundra and the boreal forests (those that grow in latitudes above 50 degrees north latitude). Animals trudge through deep fields of it, scrape it from rocks to find nibbles of sustenance, seek shelter from the cold in hollowed out drifts of it and camouflage their winter fur in its whiteness. The quality of these animals’ lives depends on how much snow falls, but also what kind of snow it is, where it blows, and how it turns to slush and refreezes. Those snow features are likely changing dramatically, because the Arctic is warming faster than any other region on Earth. But no one can say with certainty how the Artic and boreal region snowscapes are changing, because that kind of data in the remote areas of the Northern Hemisphere is almost non-existent. A paper published in the journal Environmental Research Letters on January 8, 2019, explores the problem and urges government agencies and scientists to make immediate investments in specialized snow data that can improve the study of wildlife ecology and management in the Arctic. But that kind of information is usually not available. According to the study, the density of ground-based observation stations in the Arctic is one-eighth that of the Western half of the continental U.S. (including Washington, Oregon, California, Arizona, Nevada, Utah, Idaho, Montana, Wyoming, and New Mexico). Remote observations, mostly from satellites, provide much more coverage, but usually on too large a scale to be useful for wildlife studies. Features that affect wildlife may occur across an area of just a few meters, but satellites tend to capture multi-kilometer-scale data. What’s more, higher resolution data doesn’t capture the types of features that are important to wildlife. For Gurarie, a quantitative wildlife ecologist who studies caribou migrations, that means a lot of unanswered questions about the conditions that trigger the animals’ spring migration, the longest overland migration in the world. 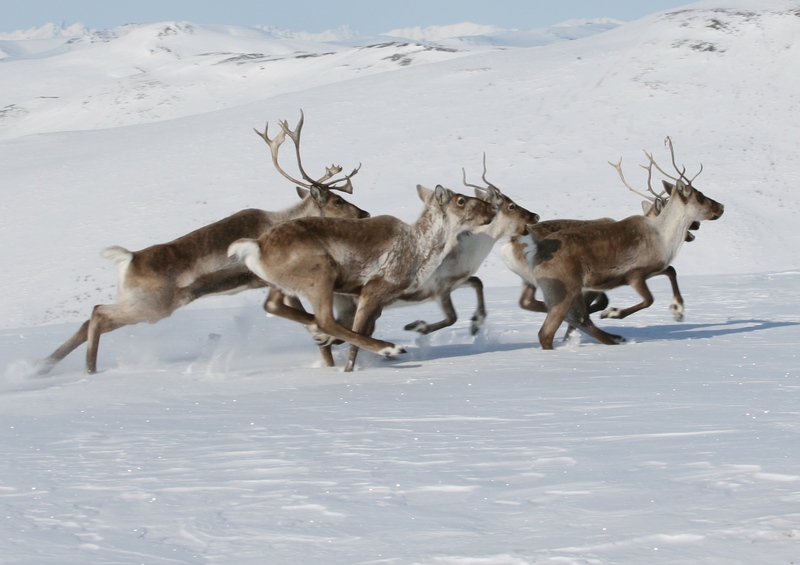 Culturally and economically important to the people of the Arctic, caribou travel thousands of miles every year across a frozen landscape of bogs, rivers and mountains. Changing conditions are threatening that journey. Rain and refreezing events that create hard ice layers have often prevented the animals from foraging and even led to catastrophic die-offs. According to Gurarie, there is an urgent need to understand how these events and other snow conditions are changing from year to year as the Arctic warms. 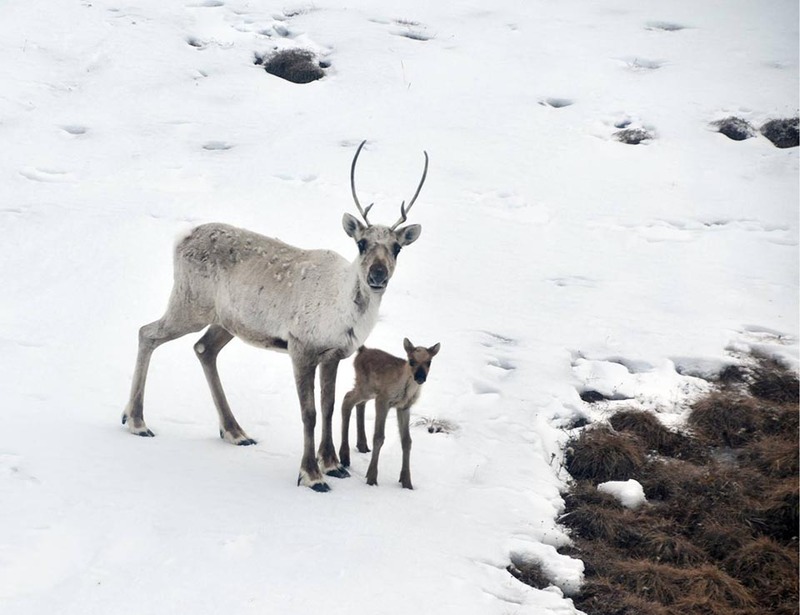 In this study, Gurarie and his colleagues were surprised to find that there is almost no correlation between the timing of snowmelt—as observed with satellites—and the timing of caribou migration. But their ongoing studies have shown that it is not so much the presence of snow as it is the quality of snow that affects caribou movement. Their work highlights the importance of understanding snow properties such as snow depth, hardness and timing of ice melt on the tundra’s many waterbodies, but they don’t have enough data to create a clear picture. In addition to caribou, the paper’s authors highlighted the need for more specialized snow data products and increased data resolution to study other Arctic wildlife, including polar bears and Dall sheep. Polar bears require deep, fluffy snow drifts to make their dens. Changes such as increasing rain and refreeze events create icy layers and reduce insulating properties of snowpack, which may limit suitable polar bear den sites. Identifying potential denning sites is important in areas where warming climate is leading to more frequent encounters between polar bears and people, but it requires an understanding of wind, drifting snow and topographical features over a scale of just a few meters. The researchers also pointed to previous research conducted by the study’s coauthors from the University of Washington and the National Park Service on the foraging behavior of Dall sheep whose populations have declined by as much as 70 percent in some areas over the past decade. Using satellite data from NASA’s Moderate Resolution Imaging Spectroradiometer (MODIS), which views 2,400 kilometers of Earth at a time, they determined that Dall sheep prefer areas with low snow cover. Meanwhile, inputting more fine-scaled data about snow quality into the computer model SnowModel found that when Dall sheep travel in snow-covered areas, they prefer low-density, shallow snow. These findings indicate that both high- and low-resolution studies are needed. The researchers point to these three case studies as examples of why a more robust, integrated approached should be applied to the development of new snowscape tools for studying wildlife. They recommended a data model fusion approach, outlining a series of actions to improve current tools and develop new ones. Among those actions, the authors called for more collaboration among the current agencies and organizations that gather meteorological data in the Arctic and Boreal region. They urged immediate investment in more specialized data such as snow depth, density, hardness and collapse pressure. Their approach calls for more on-the-ground monitoring stations, especially in wilderness areas far from road networks. In addition, they suggest greater use of animal-mounted cameras and sensors to add to and validate remotely collected data. They suggest that an airborne snow campaign, similar to NASA’s SnowEx campaign focused on mapping the water content of snow cover in Colorado’s forested ecosystems, will be an essential component of effective research into wildlife snow interactions in the Arctic and Boreal region. In addition, they report that existing computer models should be modified and enhanced to incorporate snow variables relevant to wildlife. Gurarie hopes this work will help researchers and decision-makers at places like the National Science Foundation, NASA and the National Weather Service justify new investments in higher quality snow monitoring data and more ground stations. The research paper, Integrating snow science and wildlife ecology in Arctic-boreal North America, Natalie T Boelman, Glen E Liston, Eliezer Gurarie, Arjan J H Meddens, Peter J Mahoney, Peter B Kirchner, Gil Bohrer, Todd J Brinkman, Chris L Cosgrove, Jan U H Eitel, Mark Hebblewhite, John S Kimball, Scott LaPoint, Anne W Nolin, Stine Højlund Pedersen, Laura R Prugh, Adele K Reinking and Lee A Vierling, was published in Environmental Research Letters on January 8, 2019. This work was supported by the NASA ABoVE project (Award Nos. NNX15AT72A, NNX15AT74A, NNX15AT89A, NNX15AT91A, NNX15AU13A, NNX15AU20A, NNX15AU21A, NNX15AV92A and NNX15AW71A), NASA (Award No. 80NSSC18K0571), and the National Science Foundation (Award Nos. 1603777, 1556248, 1564380 and 1602898).